Our course library includes thousands on-demand and online courses across a range of technology subject areas, including cloud, mobile, security, IT, and data. We have built our exclusive course library primarily by engaging our world-class community of subject-matter experts, or authors. 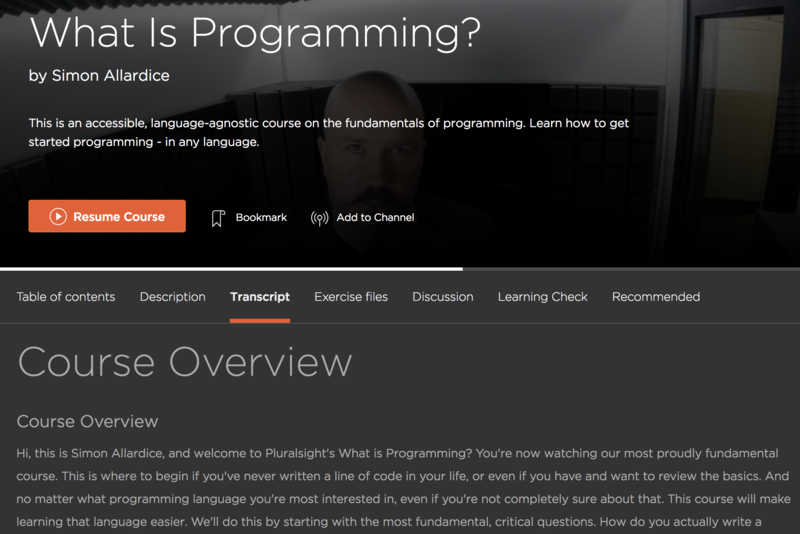 Pluralsight organizes courses into paths. You can use channels and bookmarks to organize your courses. Plus, complete a course, and you'll get a certificate of completion! There is no limit to how much you can view with a paid subscription. To find out the maximum number of courses you can download for offline viewing, click here. Individual trial users are subject to a 200 minute maximum during the trial, but that's removed when you purchase a subscription. What can I do from a video course's page? Tip: If you have questions specifically about the video player, such as questions about closed captioning, video speed, and video troubleshooting steps, please visit our video player section here. How frequently are new courses released? We publish new courses daily! For subscribers of Pluralsight, you can see our newest courses anytime. If you do not have a subscription, but are still interested in our newest courses, they're always available under our browse courses section. All of our new course launches can be found on our official Twitter feed, @allthecourses. We don't have an RSS feed of our courses at this time. If you have any topics that you cannot find material for, please don't hesitate to reach out to our Support team at support@pluralsight.com. How else can I learn on Pluralsight? Besides video courses, Pluralsight also offers Projects, Interactive Courses, and Guides to help you on your learning journey. If you'd prefer to read a transcript or text version of what's found on our videos, we offer transcripts for many of our courses. At this time, our course transcripts are not available for download. When browsing content, courses with transcripts have a CC icon after the course title. Within a course, look for the Transcript section in the navigation bar. Tip: Did you know you can jump to any portion of a course using our transcripts? To do so, click on any sentence or header within a transcript. You will be taken to the video covering that portion of the course. If you don't see a transcript option we're sorry about this! This means the course has not been transcribed yet. You can always reach out to our support team at support@pluralsight.com and suggest we create a transcript for it, though.